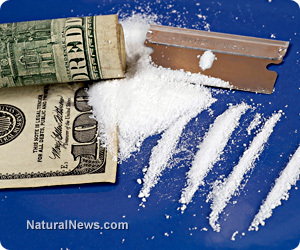 (NaturalNews) A team of researchers led by Ronald Crystal at Weill Cornell Medical College in New York have developed two "anti-addiction" vaccines, which stop cocaine from reaching the brain. Crystal says he hopes to see people "thinking about addiction the same way you think about mumps and measles and polio, and eradicating it." The first vaccine uses viral proteins of a modified cold virus attached to cocaine-like molecules to trigger the body to produce cocaine antibodies. During trials on monkeys, researchers used an imaging molecule paired with PET brain scans to measure how effective the vaccine was in preventing cocaine from reaching the brain. LiveScience reported, "In the monkeys with the cocaine vaccine, the imaging molecule lit up the brain like fireworks. This means little to none of the cocaine administered made it into their brains.... Unvaccinated monkeys gave a much dimmer signal in the brain." The second method uses a type of gene therapy to introduce the cocaine-like virus into the liver; the liver then produces genetic material that contains a blueprint for the cocaine antibody. Rats vaccinated with this second method produced an abundant amount of cocaine antibodies and did not display symptoms of getting "high" for up to 17 weeks after vaccination. Thomas Kosten, a researcher for Baylor College of Medicine called the carriers used by Crystal's team "interesting." Kosten's approach, which reached human trials in 2013, uses cholera attached to a cocaine-like molecule to trigger an immune response to the drug. Vaccines developed by Crystal's and Kosten's teams would most likely require periodic vaccination. LiveScience explains that the vaccines block cocaine from reaching the brain, thus preventing a high in the user, but do not deal with or treat the desire to feel the high, therefore "there is a worry that drug addicts would try to 'out-compete' their antibodies against the drug by taking it in much larger amounts." Researchers at Weill Cornell Medical College still have to test the toxicity of the vaccines, but planned to begin human trials by mid-2014.